George and Martha Washington Return to Morristown - February 22, 2015 ~ The History Girl! 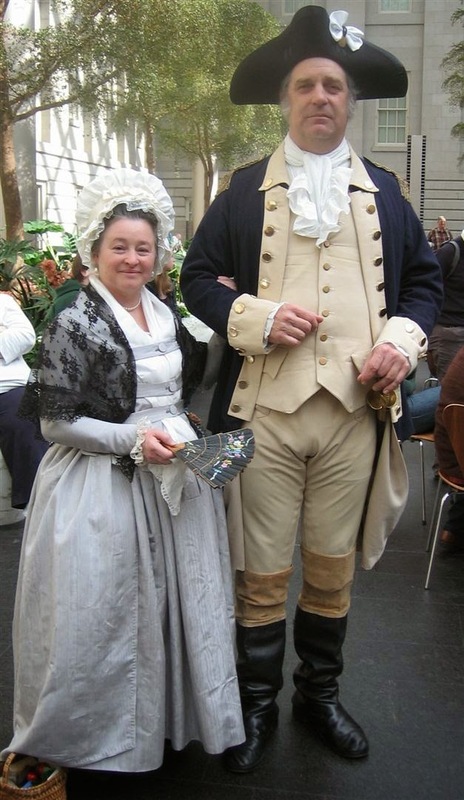 Re-enactors portraying George and Martha Washington will reminisce about that challenging time in American history during a presentation Sunday, February 22 from 3:00 - 4:00 pm at the Morristown National Historic Park Museum Auditorium, 30 Washington Place, Morristown, NJ. The free program, hosted by the Morristown National Historic Park (NHP) in cooperation with the Jacobus Vanderveer House & Museum in Bedminster, is funded by a grant from The Ann L. and George H. Clapp Charitable and Educational Trust. "It is widely acknowledged that George Washington slept just about everywhere during the Revolution. Most people don't realize, however, that his wife, Martha, also spent many a night away from Mount Vernon with her husband at winter encampments," observed Jude Pfister, D. Litt., Chief of Cultural Resources, Morristown National Historic Park Museum. "That was, indeed, the case at the Morristown 1779-1780 encampment." The program is free of charge, but registration is suggested. Register online at: www.jvanderveerhouse.org. The Friends of the Jacobus Vanderveer House received a $15,000 grant to develop and support history programs targeted to K-12 students. The programs will be held either at the Jacobus Vanderveer House (with financial support available for busing, when needed) or taken directly into schools/classrooms. The grant also encourages the development of cooperative programming with peer historic sites, such as Morristown National Historic Park, to facilitate educational outreach. Morristown National Historical Park was established on March 2, 1933 as the nation's first designated "National Historical Park. " The National Park Service at Morristown National Historical Park preserves, protects and maintains the landscapes, structures, features, archaeological resources and collections of the Continental Army winter encampments, the headquarters of General George Washington, and related Revolutionary War sites at Morristown for the benefit and inspiration of the public. The park interprets the history and subsequent commemoration of these encampments and the extraordinary fortitude of the officers and enlisted men under Washington's leadership. For general information about Morristown National Historic Park, visit www.nps.gov/morr or call 973-539-2016 x 210.